From plumbing installations for new home construction to general repairs and maintenance, you need to know that you are working with a reliable plumber. I provide you with a top quality service to ensure you are happy with the final outcome. Don't live in a home that isn't fully functional and has a range of plumbing defects. You can get all repairs and general plumbing maintenance services to fix all leaky pipes, lack of hot water, blocked drains and drainlaying needs, laundry fit outs and much more. 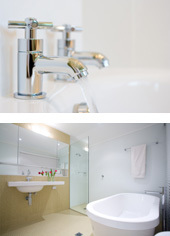 Get a top quality and great looking home makeover, renovation or alteration for your bathroom, kitchen or laundry. We provide professional plumbing installations and gasfitting to ensure you get a quality home that you're proud of. Whether you are building onto your home or are constructing a new home, I can provide you with all the plumbing installations you need. I am Master Plumbers certified for gasfitting and drainlaying so you can rest assured you get a full service. Make sure you and your family have all the hot water you need and a reliable hot water cylinder. With professional installations and replacement, and reliable gasfitting installations, you can be sure you and your family live comfortably under your roof. Get in touch today to find out more about how I can help you.